Tidal Energy or Tidal Power as it is also called, is another form of hydro power that utilises large amounts of energy within the oceans tides to generate electricity. Tidal Energy is an “alternative energy” that can also be classed as a “renewable energy source”, as the Earth uses the gravitational forces of both the moon and the sun everyday to move vast quantities of water around the oceans and seas producing tides. As the Earth, its Moon and the Sun rotate around each other in space, the gravitational movement of the moon and the sun with respect to the earth, causes millions of gallons of water to flow around the Earth’s oceans creating periodic shifts in these moving bodies of water. These vertical shifts of water are called “tides”. When the earth and the moons gravity lines up with each other, the influences of these two gravitational forces becomes very strong and causes millions of gallons of water to move or flow towards the shore creating a “high tide” condition. Likewise when the earth and the moons gravity are at 90o to each other, the influences of these two gravitational forces is weaker and the water flows away from the shore as the mass of water moves to another location on the earth, creating a “low tide” condition. This ebbing and flowing of the tides happens twice during each period of rotation of the earth with stronger weekly and annual lunar cycles superimposed onto these tides. When the moon is in perfect alignment with the earth and the sun, the gravitational pull of the moon and sun together becomes much stronger than normal with the high tides becoming very high and the low tides becoming very low during each tidal cycle. Such tides are known as spring tides (maximum). These spring tides occur during the full or new moon phase. The other tidal situation arises during neap tides (minimum) when the gravitational pull of the moon and the sun are against each other, thus cancelling their effects. The net result is a smaller pulling action on the sea water creating much smaller differences between the high and low tides thereby producing very weak tides. Neap tides occur during the quarter moon phase. Then spring tides and neap tides produce different amounts of potential energy in the movement of the sea water as their effects differ from the regular high and low sea levels and we can use these tidal changes to produce renewable energy. So we can say that the tides are turning for alternative energy. So we now know that the constant rotational movement of the earth and the moon with regards to each other causes huge amounts of water to move around the earth as the tides go in and out. These tides are predictable and regular resulting in two high tides and two low tides each day with the level of the oceans constantly moving between a high tide and a low tide, and then back to a high tide again. The time taken for a tidal cycle to happen is about 12 hours and 24 minutes (called the “diurnal cycle”) between two consecutive high tides allowing Oceanographers and Meteorologist to accurately predict the ebb and flow of the tides around the oceans many years in advance. The main big advantage of this is that the tides are therefore perfectly predictable and regular unlike wind energy or solar energy, allowing miles of coastline to be used for tidal energy exploitation and the larger the tidal influence, the greater the movement of the tidal water and therefore the more potential energy that can be harvested for power generation. Therefore Tidal Energy can be considered as a renewable energy source as the oceans energy is replenished by the sun as well as through tidal influences of the moon and suns gravitational forces. Since the position of the earth and the moon with respect to the sun changes throughout the year, we can utilise the potential energy of the water contained in the daily movement of the rising and falling sea levels to generate electricity. The generation of electricity from tides is similar in many ways to hydro-electric generation we looked at in the hydro energy tutorials. The difference this time is that the water flows in and out of the turbines in both directions instead of in just one forward direction. Tidal energy, just like hydro energy transforms water in motion into a clean energy. The motion of the tidal water, driven by the pull of gravity, contains large amounts of kinetic energy in the form of strong tidal currents called tidal streams. The daily ebbing and flowing, back and forth of the oceans tides along a coastline and into and out of small inlets, bays or coastal basins, is little different to the water flowing down a river or stream. The movement of the sea water is harnessed in a similar way using waterwheels and turbines to that used to generate hydro electricity. But because the sea water can flow in both directions in a tidal energy system, it can generate power when the water is flowing in and also when it is ebbing out. Therefore, tidal generators are designed to produce power when the rotor blades are turning in either direction. However, the cost of reversible electrical generators are more expensive than single direction generators. Tidal Barrage – A Tidal Barrage is a type of tidal power generation that involves the construction of a fairly low dam wall, known as a “barrage” and hence its name, across the entrance of a tidal inlet or basin creating a tidal reservoir. This dam has a number of underwater tunnels cut into its width allowing sea water to flow through them in a controllable way using “sluice gates”. Fixed within the tunnels are huge water turbine generators that spin as the water rushes past them generating tidal electricity. Tidal barrages generate electricity using the difference in the vertical height between the incoming high tides and the outgoing low tides. As the tide ebbs and flows, sea water is allowed to flow in or out of the reservoir through a one way underwater tunnel system. This flow of tidal water back and forth causes the water turbine generators located within the tunnels to rotate producing tidal energy with special generators used to produce electricity on both the incoming and the outgoing tides. The one disadvantage of Tidal Barrage Generation, is that it can only generate electricity when the tide is actually flowing either “in” or “out” as during high and low tide times the tidal water is stationary. However, because tides are totally predictable, other power stations can compensate for this stationary period when there is no tidal energy being produced. Another disadvantage of a tidal barrage system, is the environmental and ecological effects that a long concrete dam may have on the estuaries they span. Tidal Stream – A Tidal Stream Generation system reduces some of the environmental effects of tidal barrages by using turbine generators beneath the surface of the water. Major tidal flows and ocean currents, like the Gulf Stream, can be exploited to extract its tidal energy using underwater rotors and turbines. Tidal stream generation is very similar in principal to wind power generation, except this time water currents flow across a turbines rotor blades which rotates the turbine, much like how wind currents turn the blades for wind power turbines. 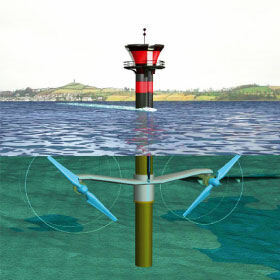 In fact, tidal stream generation areas on the sea bed can look just like underwater wind farms. Unlike off-shore wind power which can suffer from storms or heavy sea damage, tidal stream turbines operate just below the sea surface or are fixed to the sea bed. Tidal streams are formed by the horizontal fast flowing volumes of water caused by the ebb and flow of the tide as the profile of the sea bed causes the water to speed up as it approaches the shoreline. As water is much more denser than air and has a much slower flow rate, tidal stream turbines have much smaller diameters and higher tip speed rates compared to an equivalent wind turbine. Tidal stream turbines generate tidal power on both the ebb and flow of the tide. One of the disadvantages of Tidal Stream Generation is that as the turbines are submerged under the surface of the water they can create hazards to navigation and shipping. Other forms of tidal energy include tidal fences which use individual vertical-axis turbines that are mounted within a fence structure, known as the caisson, which completely blocks a channel and force water through them. Another alternative way of harnessing tidal power is by using an “oscillating tidal turbine”. This is basically a fixed wing called a Hydroplane positioned on the sea bed. The hydroplane uses the energy of the tidal stream flowing past it to oscillate its giant wing, similar to a whales flipper, up and down with the movement of the tidal currents. This motion is then used to generate electricity. The angle of the hydroplane to the flow of the tide can be varied to increase efficiency. Tidal energy is another form of low-head hydro power that is completely carbon neutral like wind and hydro energy. Tidal power has many advantages compared to other forms of renewable energy with its main advantage being that it is predictable. However, like many other forms of renewable energy, tidal energy also has its disadvantages such as its inflexible generation times dependant upon the tides and the fact that it operates in the hostile conditions of the oceans and seas. So here are some of the advantages and disadvantages associated with “tidal energy”. Tidal energy is a renewable energy resource because the energy it produces is free and clean as no fuel is needed and no waste bi-products are produced. Tidal energy has the potential to produce a great deal of free and green energy. Tidal energy is not expensive to operate and maintain compared to other forms of renewable energies. Low visual impact as the tidal turbines are mainly if not totally submerged beneath the water. High predictability as high and low tides can be predicted years in advance, unlike wind. Large tidal reservoirs have multiple uses and can create recreational lakes and areas where before there were none. Tidal energy is not always a constant energy source as it depends on the strength and flow of the tides which themselves are effected by the gravitational effects of the moon and the sun. Tidal Energy requires a suitable site, where the tides and tidal streams are consistently strong. Must be able to withstand forces of nature resulting in high capital, construction and maintenance costs. High power distribution costs to send the generated power from the submerged devices to the land using long underwater cables. Changes to estuary ecosystem and an increase in coastal erosion where the tides are concentrated. Build up of silt, sediments and pollutants within the tidal barrage from rivers and streams flowing into basin as it is unable to flow out into the sea. Danger to fish and other sea-life as they get stuck in the barrage or sucked through the tidal turbine blades. We have seen that there are two ways to harness energy in tidal power generating systems: the first uses a tidal barrage system to store water in a tidal reservoir or tidal basin behind a large wall or dam, while the second uses the oceans tidal streams and tidal currents below the surface of the sea. Tidal energy requires a large capital investment in dams, turbines and support ships, but once a “tidal power” plant is built the energy it generates is essentially free with the system being relatively inexpensive to run. The project costs involved and also the finding of a suitable tidal location make “tidal energy” unsuitable for small scale energy production or home DIY power generation. However, waterwheels and tidal turbines have been built and used for many years at the side of small tidal inlets, rivers and canals to utilise the ebbing and flowing of the tidal waters with sluice gates and canal gates used to control the flow of water. These tidal devices were generally used to grind corn or produce mechanical power in tidal mills. In the next tutorial about tidal energy, we will look at tidal barrages in more detail including their construction and potential to generate free and green tidal electricity. For more information about “Tidal Energy” and how to generate your own electricity using the power of the sea, or obtain more tidal energy information about the various tidal energy systems available, or to explore the advantages and disadvantages of tidal power, then Click here to order your copy from Amazon today about ocean, tidal and wave energy, the energy revolution from the sea. No. I just means that it might be expensive to start with. But after that, it takes almost no money to operate and to fix. The waves are free. And as long as we have the sun and the moon, we will still have the waves. The gravitational pull from the sun and the moon is what’s causing the waves to form. So we won’t need to pay any money for them. Depending on how much energy you need, it takes approximately $1, 500 and can reach up to $10, 000 in price. As compared to a wind turbine, this is nothing. A wind turbine can cost $400, 000 and can reach prices of $650, 000. Plus, wind is not always a reliable source. We can’t tell when we will have wind and when we won’t, compared to tidal’s. And depending on how many water turbines you need, it can either cost you a small amount, or a large amount. I hope this helps!!! Who wrote the article. I’d like to cite them in my dissertation. can I know what date date this is published? its a good website u don’t need to say that its pointless. Seriously. You probably should stop putting up posts due to the fact you can’t finish a sentence. In fact your name is a jumbled piece of rubbish. i need to use this for school but i don’t understand any of this!! The website was really clear. I’m not a smart student and I understood what the website creator is saying. I understood the presentation but how will I build it for my son as a school project ???? I completely agree with you Lily. How about making a list of steps so it is easy for us to learn. I understand obtaining energy from tidal flow; it is as old as the first water wheels for grist mills. My concern is trying to find a tidal generator that uses vanes and stators in a circular form housing as the prime mover to be used in sheltered shallow water, approximately twenty feet (7 or so meters) depth. Locations would be in South East Alaska, the output would be smallish as experiments and power up about 200Kw, probably no more than 500Kw. My thinking is a longer generator rather then a larger diameter unit. Nice explanation on tidal energy. I have read in another post on civilengineeringbasic.com/tidal-energy-advantages-disadvantages/ that “building tidal power plants takes a large amount of money upfront.” Is that means tidal energy is expensive to use? Tidal energy has a lot of potential and should be investigated more. Here in Scotland there are companies with all sorts of machines in the sea but the fail quickly due to the force of the waves. Nice article by the way. Lisa:- Wave energy and tidal energy are two different things. Wave energy has to be extracted by something which absorbs the vertical movement of water as successive waves pass it by – an early example was Professor Salter’s “Nodding Ducks”. Leaving aside tsunamis, which can be very destructive, wave energy normally originates from winds blowing over the surface of the sea. Tidal energy is mostly horizontal in direction, being the flow of a large mass of water which surges around the world under the influence of solar and lunar gravitational forces. That energy is usually harnessed by turbines of one kind or another as the article says.